From Police Interceptor to Cobra Jet, all 428 carburetion was definitely not the same. 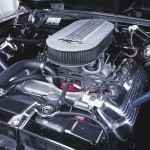 The venerable 428 FE (Ford Edsel) engine has always been a favorite of Ford enthusiasts. 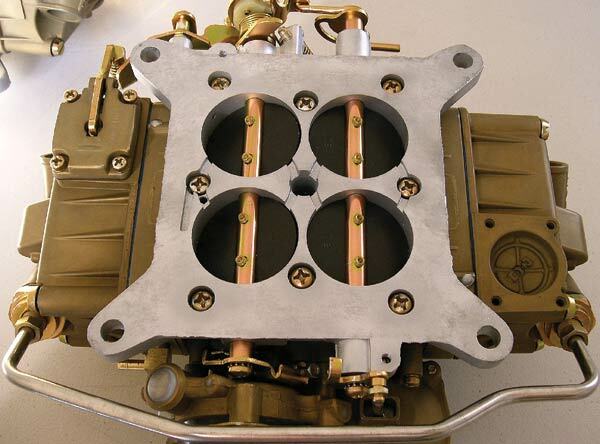 It is with that thought and spirit we present this article on the carburetors of the 428. The 428 was introduced in 1966 on Galaxies and Thunderbirds. It is interesting that if you bought a 1966 Galaxie with a 352 cubic-inch V8, you got an Autolite 4100 (1.12” venturi) that was 600 cfm. If you bought either a 390 or a 428 in a Galaxie or T-Bird you got an Autolite 4100 (1.08” venturi) that was 480 cfm. Ford did this for emissions purposes. Certainly the 428 was a torque machine, and if you had enough carburetor for about 5,000 rpms, that was about as fast you needed to spin that engine anyway. Starting in 1966, you could also get a 428 Police Interceptor (only sold to police entities). These had the larger 600 cfm 4100. Through 1967, 1968, and into 1969, the only way you could get an Autolite 4100 was if you were a police entity. Ford was not silly, they knew the 4100 was the best performing carburetor, so that is what went on the Galaxie Police Interceptors only. When Ford had such a wonderful carburetor, it is shocking to me that they would have thrown all that away (except for the Police Interceptors). Ford unilaterally replaced the 4100 with the 4300 in 1967 and took a huge step backwards. We also find it interesting that if you had a 1967 289 four barrel engine, you got a 441 cfm carburetor. If you had a 428 you also got a 441 cfm carburetor. 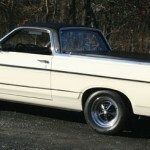 Ford was making one size of 4300 through 1967 and though mid-1968, and that was what everyone was going to get. In 1967, if you bought a Shelby G.T. 500, you were able to get a pair of Holley carburetors. Their engineering numbers are C3AF-BJ/BK. 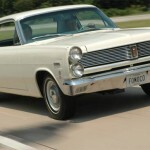 They were actually carry over engineering numbers from the 1963-½ Galaxie. This pair of Holley carburetors performs just like many other Holley carburetors have always done. They were OK, but with the usual Holley fussiness and hard hot starting. We also find it interesting that if you have a 428 engine with a race cam and all the goodies, (describing an engine that is at 90% volumetric efficiency) at 6,000 rpms it can utilize 668 cfm of air/fuel. That is a law of physics. But just to be sure we don’t run out of carburetor, we are going to put 1,200 cfm above this 428 engine. It seems like a bit of overkill doesn’t it? In 1968 Ford came out with the 428 Police Interceptor engine that was used in the early Shelby G.T. 500. It utilized a very rare Holley carburetor, engineering number C8ZX-A, for both manual and automatic transmissions. This is still a highly sought after carburetor. Once we get to the 1968-½ 428 Cobra Jet, different Holley carburetors were used. The C8OF-AB was for the automatic transmission and the C8OF-AA was for the manual transmission. The AA is the rarest of any of the Holley carburetors, and you can expect to pay big money for an unrestored (used) one. The underside view. Note the throttle plate number 172. These plates are 1-11/16″ in diameter. All Cobra Jet carburetors use these plates. The air horn of the C8OF-951-AB for a 1968-1/2 428 CJ with automatic transmission. The second line is the Holley List # 4168. The third line is the three digit date code of 834. 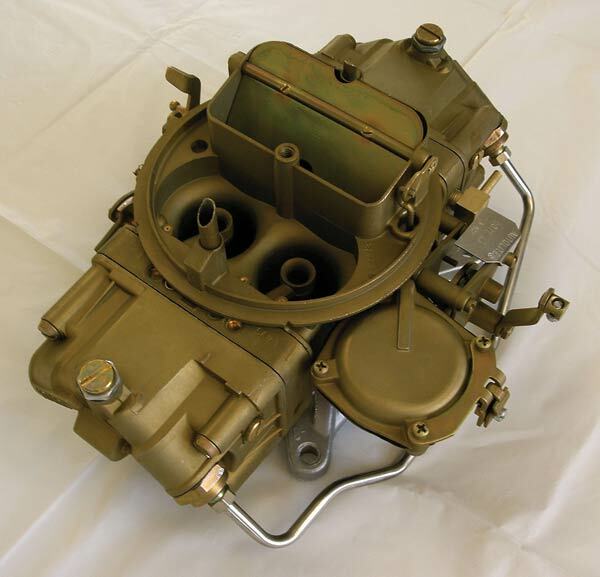 This carb was manufactured in 1968, 3rd month (March) and 4th week (of March). This is a C8OF-AB. Note the screwdriver at the driver side idle mixture screw. Also note there is NO linkage ball on the primary throttle shaft arm. 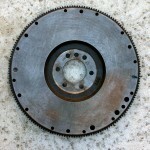 This is a D0ZF-AA for a 1970 428 with manual transmission (no A/C). Note the manual choke assembly. 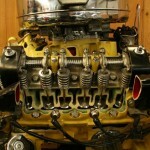 All 1970 Cobra Jet carbs had manual chokes as evidenced by the absence of the 3″ long fresh air tube. You’ll find that the center section was never drilled for the tube. Typical passenger side view of an automatic choke Cobra Jet carburetor. Note the long fresh air tube at an angle, the brass 90* distributor vacuum fitting and of course, the transfer tube between the float bowls. It needs to be said at some point, that when we read the engineering numbers off Holley carburetors, all of them have the digits 9510 between the first four characters and the last two characters. The 9510 is the Ford group number for “carburetor”. 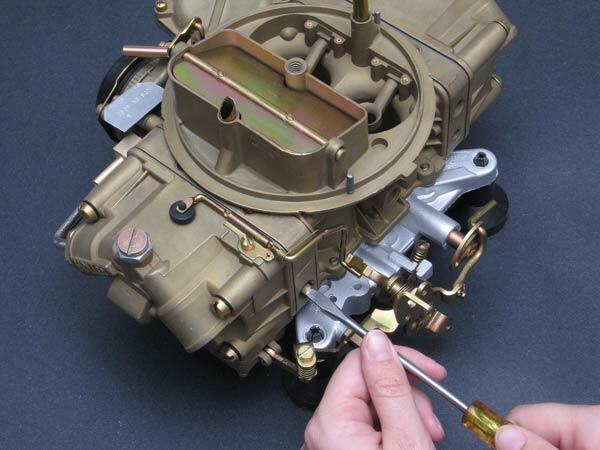 All carburetors, whether they are a one barrel, two barrel, four barrel (or whatever) are a 9510. Therefore, we can eliminate the 9510 because we know we are talking about carburetors. For example: C8OF-9510-AA would be read C8OF-AA. 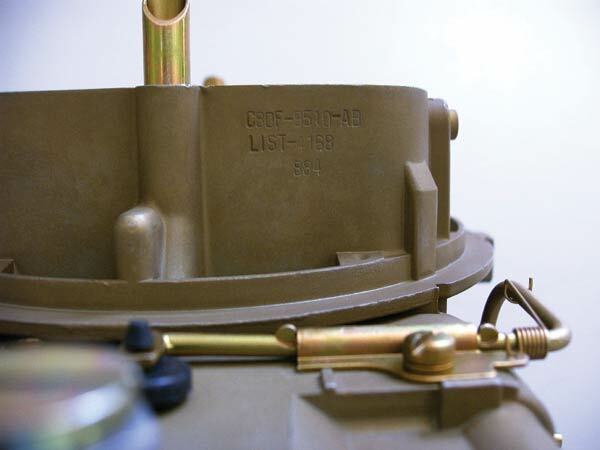 In 1969, Ford had another engineering number for the 428 CJ carburetors. They were C9AF-M for manual transmission and C9AF-N for automatic transmission (Mustangs and Cougars). If you had an automatic transmission Torino, then the carb was a C9OF-H. The difference between the C9OF-H and the C9AF-N is a kick down lever. By 1969, the Torino was only car line to not use the kick down bar from the carburetor to the transmission. This next bit of information affects both the 1970 428 Cobra Jets and the leftover 1969 Shelby G.T. 500 (428) that were re-titled as 1970s. Ford had a problem with a heat exchanger design in the exhaust manifold. This caused the automatic choke plate (butterfly) to open slower than normal. Ford was involved in a lawsuit regarding the choke staying on too long, causing an extra high idle speed. As you can imagine, on icy or snowy roads, a front heavy vehicle could experience control issues. Unfortunately, Ford did not fix the problem the way they should have by re-engineering the exhaust manifold. They simply converted all the 428s to manual choke. I always thought it was interesting that you could have a 428 Cobra Jet in a Mustang or Cougar with automatic transmission, air conditioning, electric windows, am/fm stereo and a MANUAL choke. One way to prove that these carbs had manual chokes from the factory is to take a look at the passenger’s side just below the lip where the air cleaner gasket goes. Normally you will see a ¼” fresh air tube sticking out about 2-½” from the main body of the carb. On the manual choke carbs you will see an indentation there, but the hole was never drilled. Hence, the carburetors were never equipped with automatic chokes. Regarding the leftover 1969 Shelbys, the carburetors were the leftover C9AF-M/Ns. At the Shelby plant, they were converted to manual choke and the letters “ED” were stamped in the carburetor tag. The “ED” stands for edited at the factory. 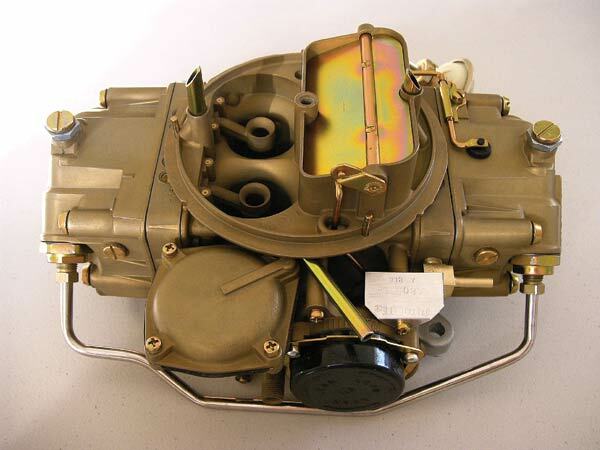 One of the most common large bore Holley carburetors was the engineering number C9AF-U. It is a list number 4609. I can’t tell you how many times I see this carburetor at swap meets being sold as a “Cobra Jet” carburetor. It is not a Cobra Jet carburetor; it is an over-the-Ford-parts-counter replacement carburetor and is listed as “all High Performance Replacement” in the Ford parts book. That is the bad side, but the good news is that it is virtually identical to the 428 Cobra Jet carburetor. It has the same metering block numbers and the same float bowls, it is just a different engineering number on the airhorn. It is not truly numbers correct, but will run identically. Note: Jon Enyeart of Pony Carburetors provided this story and photography in 2008. Jon passed away in 2011 from brain cancer. He is truly missed by many. It is a 69 Cobra fastback with a 428 Cobra Jet motor. I can’t seem to find any information as to what is the R stands for. It is a ram air car, so am I correct in assuming that the R stands for a ram air? 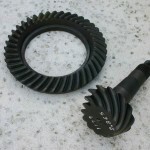 Hi I got a 4006 Holly carb, do you guys know what Ford it was on its 1,498 in diameter.